Blazer: Zara (similar style here); Shirt: Coachella festival shirt; Jeans: c/o Hudson Jeans; Shoes: Valentino; Bag: Zara (similar style here); Sunglasses: Fred Flare; Jewelry: Glass crystal necklace c/o Spike the Punch; Michael Kors watch; Lipstick: Revlon's "Persian Melon"
I love me a good Stevie Wonder reference when I can swing it -- and today's pretty fitting, right? Loving your lipstick, I am going to have to get that color! That neckalace is gorgeous! The tee looks great paired with a structured jacket too. Love your look - in fact, I just ordered the necklace from Spike the Punch! Thank you for the constant inspiration! Love your haircut and the casual look! Love this look! Have been looking for a white-black blazer and this one is too cute. I love this blazer & drastically miss casual Fridays. You look great! Enjoy your weekend!! You always look so awesome! This is a great ensemble! Love your Coachella shirt. Planning on going this year?! this is a really fresh and cool outfit. I am loving your short-do!! I love how you mixed dressy and casual items in this outfit. I particularly love that blazer! Oh how I wish we had a Zara in the Atlantic provinces. Perfect Combo, love the necklace. love your hair ! i wanna see it and straight and you without sunglasses ! wow, it'a an amazing outfit, love this combi. I love how you always look so polished and glamorous even when you're wearing something as casual as boyfriend jeans! And the bling and shoes are such great ways to feminize your outfit. So pretty! Great outfit! Love the pretty, blue clutch, especially! :) Have a great weekend! The tee and those heels, so glamorous and rocker chic! Super cute! I am loving your hair shorter btw! Just so you know, I have your blog opened in another tab and I am going backwards and determined to make it to the end (beginning)! Ohh, your necklace is truly a dream! <3 Love love love! Just bought the necklace from STP! I love your style sense. 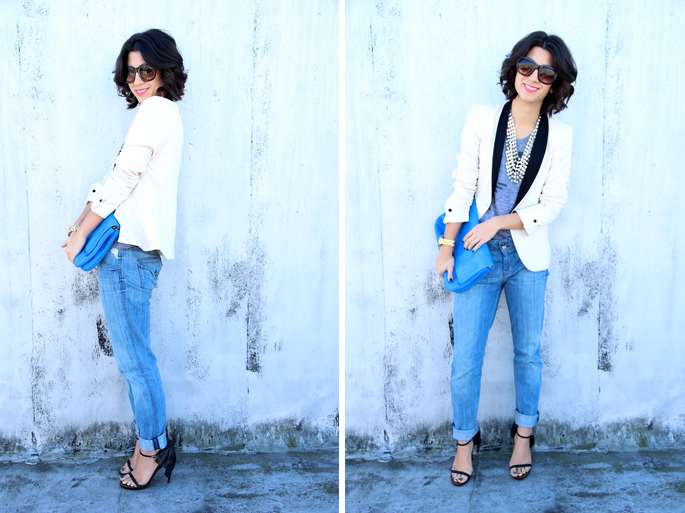 I love this outfit :) I love pairing a great blazer with some casual boyfriend jeans and a cool tee. FABULOUS! Pretty, Krystal! I always feel like im too short to wear jeans like that! That jacket fits you perfectly! I've been wanting a tuxedo blazer for so long. Love how you dressed it down with bf jeans! I loooooove this blazer...soo tempted to go out and get it! this outfit is my FAV! i love that clutch. Just got my hair cut this length. Can we get a tutorial for those amazing waves? Cute blazer. That style seems to go with so much...love the black & white ones. I LOVE your blazer, and I love the way it combines with your accessories to make what would otherwise be a very casual outfit into something that's both very classy and chic. You're so good at mixing things up and making the unexpected look perfectly natural! BTW, I've been considering getting a white & black tuxedo blazer like yours, and now I'm definitely putting it at the top of my wish list! love that jacket paired with a festival tee and boyfriend jeans! I just blogged about how I couldn't find a way to wear this exact blazer outside of pleather pants and a black top and a reader pointed me here. You look great and I cannot wait to try something similar. Thank you! !